Someone recently contacted hencam to ask if we could give two quickly-growing chicks a new home. We are always open to helping someone out with chicken problems, but as the person wasn't sure whether the chicks were male / female we asked if they would be able to send us photos first. I am off to uni at Keele at the end of this month...woop woop!! For the past week he has started crowing at 8:00am in the morning, and unfortunately he sounds like a cat being strangled, or some other sort of yowling animal in pain. Yesterday morning and this morning he has started crowing even earlier, at 4:00am when the sun rises. This is terrible, as it means i have to drag myself out of my pit and run downstairs to shut him up before he wakes the neighbours! My parents are currently at Glastonbury, and I leave for a holiday in Spain (whoohoo!) before they return, so i hope Midget behaves himself for my Nana who is coming to look after him! Anyway, Midget and Sunny are going to join their brother's when my parents get back, as Dan has decided he doesn't want them anymore. This means i won't be able to say goodbye as i am on holiday *snivel* but I know they are going to a good home! Well, yesterday we said a very difficult goodbye to Pappy, Scotty and Daisy. The chicks were thirteen and a half weeks old and, although we had been planning to keep them until they were fifteen weeks old and take them home together, Pappy decided he was an adult and had began to fight and attack his brothers. Scotty, unlike the other two boys, fought Pappy back which resulted in Pappy having some nasty cuts on his comb. He also attacked Midget and i wasn't happy about that at all - Midget is our youngest chick, and walks around looking perpetually confused. When his brother attacked him he stood with his head bowed looking very sorry for himself, and i had to run to his rescue! So Pappy, Daisy and Scotty have gone to a beautiful new home. They are still living together but have ten times more room than they did here at hencam, and so it will be easy for them to keep out of each others way! They are sharing their new home with some ducks, goslings and are even being bought their own female hens in a week or two! Lucky boys! As for Midget and Sunny, they will be spending a few more weeks here until Dan is ready to take them at the farm, unless he has a change of heart.. Yes, our mystery chicks are six weeks old today (well, technically Midget and Scotty won't be six weeks old until tomorrow, but whatever!). Although they have grown, they're nowhere near full size yet and are still 'cheeping.' Their eyes haven't turned orange yet, either, they're a weird green colour. They've been spending more and more time outside whilst the weather's nice, although it isn't until they're 7 weeks old that they'll be able to produce their own body heat, so they keep coming for cuddles under my hoodie to keep warm! Then, by the time they are fully grown, they will be off on their way back to the farm! International Respect For Chickens Day ~ May 4th! Tomorrow is International Respect For Chickens Day, which is all about “celebrating the dignity, beauty, and life of chickens and to protest against the bleakness of their lives in farming operations,” says UPC (United Poultry Concerns) president Karen Davis. 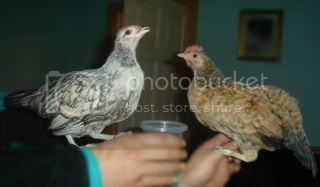 Tomorrow we will be giving our chickens - both the big and little chucks! - a special treat. We'll make them a nice meal of lettuce, grapes, spaghetti & bread, and the big girls can have a cream cake too! If these chicks had been produced for the egg industry, four of them would be dead by now. If they were broilers they would be finding it difficult to walk because of their weight, and they would be killed in one and a half weeks...Lucky chicks! Also MAY THE FOURTH is fast approaching, so get planning! And for anybody who still doesn't know what May 4th is, it's INTERNATIONAL RESPECT FOR CHICKENS DAY!!! Well, the youngest two chicks were two weeks old yesterday, and sheesh they have grown so much! You can watch them at hencam.co.uk and see how big and fuzzy they have got! I can't believe they are so big...! 7 days to go until we might possible have some chicks...cross your fingers! My dad recently brought home thirteen RIR eggs to hatch. They're fertile and in an incubator, and i've been turning them three times a day...i didn't particularly want more chicks, not after what happened to Scrambled, Webster and Luca - but when did i ever have a say in the animals? Chicken Out campaign is a success! Contrary to what you may have heard from Tesco, "reliable sources" have informed me that many supermarkets - including Tesco - have actually sold out of free-range chickens! This can only be described as a step in the right direction. The fact that supermarkets are selling out of free-range birds mean that more and more farmers will be forced to change over to raising free-range flocks to keep up with consumer demands. A Tesco spokesman said: "Sales of Tesco standard chickens have not been affected by the C4 TV programmes. "This week, daily national sales of standard whole birds are running approximately 7% above the November 2007 daily average." Oh! Some more good news: Hellmann's have stated they are starting to using purely free-range eggs in their products starting next month! This is great news, and really shows how powerful consumers really are. Well done everyone, and thank you Hellmanns'!! "In three hard-hitting programmes, Hugh Fearnley-Whittingstall explores the horrors of intensive chicken farming. The journey takes him far from the cosy lifestyle of River Cottage and into the harrowing conditions of running his own modern poultry production line." The ban on Battery Hen cages has been confirmed, and the date is set for 1st January 2012. After this date no more hens will be kept in these cages in the UK. There have been so many fireworks round here, and living on a hill is fantastic because you can see them all from the window. Thankfully, the chickens don't seem bothered by the noise at all...which is odd, as they're not scared of exploding gun powder, but they are scared when they see a bird in the tree. Weird! The chickens don't seem too fussed about the ghost at all - although they do get excited about pumpkins. They like to destroy them!! One thing i will say is that there were so many dishes over there that were foir gras, or goose liver, or veal...yack. It was fun though, and we had no prolems finding vegan meals at all, so i was happy - haha! It really does show that there is minimal difference in price between battery and free range eggs. Yes, that's right, somebody has built a chicken coop that actually resembles a chapel and has called it ... are you ready for this? ... The Chicken Chapel! Passing on an appeal from the BHWT! This just in from BHWT (the Battery Hen Welfare Trust) - aimed really at people in the Coventry area who want to help some ex-battery hens but you never know the power of the Internet! We have a new Co-ordinator in the Coventry area who will be carrying out a hen collection next weekend – 22nd September 2007. If you can offer a good home to some retiring ex-bats, please contact either Ian or Mollie on 07806 924 969. We currently have about 75 hens seeking caring homes that offer the opportunity for freedom, fresh air and free range facilities. Sweet Onion Chicken Teriyaki: 364 cals, 5.0 g's of fat, 1.4 of which saturates. As you can see, the vegetarian option is by far the healthiest, and both the options containing chicken are the ones containing the most calories, the most grams of fat and the most saturated fat. This is an article about scientists that have 'created' the first ever transgenic chickens. The article states that the new technique "may make the squawking barnyard birds as easy to genetically manipulate" ....excuse me this is a good thing? The most important bit in the whole article: "...you should be able to get a quality protein for a whole lot less money." There you go folks, it's all about money! See below for the article. Well, Milly's chicks are now in the boundary of 6 - 7 weeks old. This means that (if they were broiler chicks) they would now be the age for slaughter. These chicks still say "cheep" instead of clucking like an adult hen; they still sleep under Milly at night so they can feel safe and warm. Milly gets them grubs when they are free-ranging together, she shows them how to dust bathe and teaches them that humans are friends, not enemies. Broiler chicks never had a chance to meet their parents. They won't ever see sunlight until they are crammed into trucks and transported to the slaughterhouse. They won't get the chance to scratch in the sun, or scratch anywhere as the bedding material under their feet is thick and damp with chicken poo. For more info on broiler chicks, check the links page. Viva! has some fantastic info on broilers. Also, the scrapbook on the Chicken Factory page has some photos of broiler chicks on their way to slaughter, so feel free to look at that too. Just the right shape to snuggle! For anyone who has ever cuddled a chicken, you will know exactly what i mean...chickens are like the ultimate cushion: warm, feathery, friendly and soft! Your left arm cuddles around their chest, and your right arm can be used to stroke the chicken or support the chicken if it is too lazy to stand up (Milly :-p ) ! * and just 2 people on a diet of beef!! 40% of the world's cereals are fed to animals to produce meat when it could be used to feed humans in developing countries. At the moment only 0.3% of farms in the UK are organic. Animals raised for meat release 80 million tons of gas each year. Livestock accounts for 15 - 20 % of global methane emissions. A useful site for keeping chickens - colourful, cute and an easy to understand layout. And the United Poultry Concern site. PS. We have 3 new chickies hatched by Milly, who is a proud parent - visit hencam to watch them! First of all, if you head over to the hencam website (check "Links" page if you don't know the url by now!) then you will be able to see Milly sitting on her fertile eggs. Today is day 19, and the chicks are due to hatch on day 21. By now the chicks should be communicating (ie. cheeping) to each other and to Milly from inside the eggs. Right, now onto the news about Eva. As you know she was our lovely ex-battery hen that was rescued from a Chicken Factory in the village next to ours. 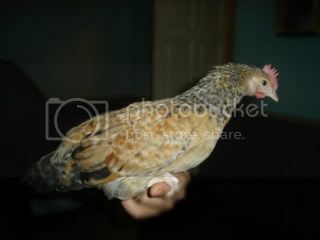 She was a gorgeous little hen and amazingly friendly, but sadly she passed away on the 29/12/06. However, it is almost a year since we rescued her. We rescued her on the 6th July last year and brought her home and put her in a spare coop--in fact the same one that Milly is in now! Anyway, i'm planning a little party in memory of her. Yes it's sad (sad as in the nerdy way!) but it's good fun and helps remember her. Cakes will be baked and given to the hens, and i shall waft a photo of Eva at them...and they will probably take no notice at all!! Milly currently has some fertile eggs under her (six to be exact) and we're all just hoping things go okay...we did start off with seven, but one was accidentally smashed by Penny went she went up to the nest box to lay. As a result, Milly has been moved into her own little 'broody' coop. Okay, so you always hear me ranting about how small battery cages are...well, *hopefully* we will be getting some proof here at Hencam HQ. United Poultry Concerns (UPC)are giving away used battery cages that have come from an abandoned battery farm. They have been washed, and hopefully we will be getting one. We'll take some photos of Milly next to the battery cage so you can see how small they really are...and keep in mind that there are up to eight birds squeezed into one cage. I'm adding the UPC webiste to the Links page if you want to have a look! One last thing, the chocolate bars that turned their recipes non-veggie have switched back to a veggie recipe again, so they are SAFE TO EAT for all you veggies out there...I think it was nothing more than a publicity stunt, frankly. We're going to see Lottie this weekend up at the farm where she lives. She'll be 6 weeks old tomorrow, so it'll be interesting to see if she has grown at all. "If the customer is an extremely strict vegetarian, then we are sorry the products are no longer suitable, but a less strict vegetarian should enjoy our chocolate"
'Less strict' ...Hmmm great terminology, Paul Goalby. *cough* idiot *cough* And also, who could call themselves a vegetarian when they eat something from the stomach lining of a calf?!?! I went to sit with the chickens in the coop today and, as usual, Lottie followed me in. Over the past few weeks the chickens have got used to her, and don't mind her sniffing round the coop. Having her IN the coop, on the other hand, is a totally different matter...They HATE having her in there, especially when she goes to sniff them! Today they seemed quite relaxed, and even let Lottie have a sniff around...then Lottie had to go and ruin it by sniffing at Penny. 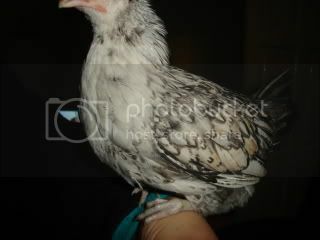 Penny (the most nervy chicken on the planet!) started flapping and clucking and that, of course, set Tilly and Milly off as well. Somehow they managed to push the coop door open and escape into the garden. I thought it was going to take me hours to get them all to go back in, because chickens aren't as stupid as you think and are amazing at not going where you want them to! Still haven't got much chance to email people and update the site, so i apologise for that! So, for the peeps that check out hencam, you will have heard that three weeks ago we were given a pet lamb to look after. Lottie is a very sweet little girl, but she needs LOTS of time and energy devoted to her. She loves to be the centre of attention, and adores company. Consequently i am spending a lot of time out in the garden playing and sitting with her. I haven't even had much chance to sit with the chickens, as Lottie insists on coming in the chicken coop with me...seeing as the girls are terrified of the lamb, this doesn't quite work out! Sorry about the pages been unavailable recently - we had severe hosting issues with our last provider and had to move the website in an emergency procedure! The new hosts are Exa Networks and are much friendlier and a lot more reliable! Walking past the factory the other day and crates of chickens were being moved into the factory...I wish i had had my camera with me. I was too far away to see if the chickens satcked in the crates were battery or broiler chickens, but i'm pretty sure they were battery hens because they had huge floppy combs, and from what i could see they weren't obese enough to be broiler chicks. I might add a story to the Chicken Factory page, but i aren't sure yet. It's not fascinating information or anything, but it's quite sad. And i think that's all for now! So, here it is again...another wave of media reports stating the dangers of Bird Flu. Back then we were much more naive and thought the girls were actually at risk from bird flu, what with all the hype going round, but now we have come to realise that as long as they are kept seperate from wild birds there is only a minimal chance of infection. The 'Eva's Story' page has been updated to say that she has passed away, and the link to all her photos has been put in there as well. This is so that it won't get pushed down from the 'Blog' page. It's so cold here, the chicken's water was all iced over this morning and we had to top it up with hot water. Then again at about half past four before the hens went to bed. It's definitely getting colder round here! Info from the site-Link in links page! In other words, not only is the egg industry cruelly confining hens in cages, it’s also deceiving consumers about that abuse. Also, watch out on for a scrapblog of all the photos of Eva that we have :-) Well, some will be left out but only because they will be blurred etc...It shoul be ready within the next few days. Just when we thought Eva had recovered from her illness, I went into the coop this morning to feed her and she was curled up in the sand pit, not moving. Milly was trying to get past me to scratch in the dirt, whereas Tilly and Penny were stood close to Eva. Penny was staring at her and clucking, and Tilly was grooming her. Tis a sad day, but she has lived with us for a wonderful 6 months and has been a lovely little chicken. For the last few days Eva hasn't been acting like herself. She has been very quiet, standing in one spot and sleeping a lot. She keeps being sick and is doing lots of runny poos! <------- sorry if that's TMI!! She seems a lot happier today, and i am happy that she managed to eat and drink something. This is a fab site if you are after campaign material for better animal rights, an end to factory farming, or reasons to go Veggie/Vegan. However, it is also good if you are trying to find information about how animals are kept, treated and killed in factory farms and slaughter houses. The link to the website is also in the links page. I have found some useful info that DEFRA (Department for Environment Food and Rural Affairs) have on their website and picked out some of the most "yucky" [insert disturbing, sad and horrible here] comments on the treatment of farmed animals. Well, anyway, I had put Milly and Eva back in the coop and i went to check that the house was clean and, over in the far corner of the nest box, was an egg!! I closed the house and went round the other side to open up the next box. It was a perfect pale brown egg!! Now, Milly, Tilly and Penny are almost definitely not laying, as they have just finished moulting and have just grown all their new feathers. I'm guessing that the egg must be from Eva, as she didn't moult because she was too busy trying to grow feathers to cover her bald patches. Now all her feathers have grown again, maybe she was giving us one last egg before she has a rest over the winter? Well, as you may have seen on hencam, the chickens have masacred the pumpkin that we put in for Halloween...there is a single strip of skin left, about 10cm long, and they have eaten the rest. Yes, they even ate the skin!! Eva has a sprinkling of new feathers growing, covering the few remaining bald patches on her bottom, and Penny is still recovering from moulting. She's looking very thin and raggedy...it has taken her about twice as long to grow her feathers as Tilly and Milly! The chickens didn't seem too bothered by the fireworks on Bonfire Night. I don't know about when they were in bed, but when they were down in the coop and a firework went off they rarely reacted; unless it was a loud rocket, when they jumped and did the danger call. But all in all, they weren't too bothered. I've finally managed to upload the pics, here are some random ones that don't fit anywhere else, click here to view them! It may take a while, but i would think that if the photos aren't on the site by seven o clock then i have failed miserably. I will put links to the scrapbook on the site, either in the blog or on a new page...to see the pictures, just click on the links. Oh, and Penny and Milly are moulting. Penny is at the bald-with-blue-spines stage, and Milly has just got her first bald spot. Because it is winter, and due to the fact that the girls are moulting and it is winter, they are laying us no eggs...naughty chucks, he he! So, this week i have been totally bogged down with homework (joy!) but whilst i was working i have managed to come up with (what i hope to be) a fool proof plan to take photos of the chickens at the factory. Wish me luck everyon! Goodnight! Eva still has feathers growing on her bottom by the way-yay! They are all tufty and brown, bless her! Also, Milly and Eva were both sat on my lap yesterday, side-by-side. Milly didn't even try to peck Eva, and they both slept next to each other in the sun, which was nice. Okay, last silly story for tonight...Milly was on my lap yesterday, and she was staring at me as she sometimes does...and then she burped in my face! And it smelt as well...yuck! So i said, "Milly, that is so rude!" And she acted really disgusted with me and flew down!! "The total number of eggs produced in the UK every year (source: DEFRA 2000 figures) number 8,940 million. The vast majority - 74 per cent - are produced intensively in 'battery hen' cages. Only 20 per cent are currently produced under 'Free-Range' systems and 6 per cent are produced in 'barn' systems. " Banning battery cages: "Elliot Morley, Animal Welfare Minister, recently stated he was not convinced enriched cages had any real advantages over conventional barren cages and is calling for opinions as to whether the UK should follow Germany's example and go further than the EU directive by banning enriched cages too." This is interesting: "Given the vast scale of egg production in the UK - the egg industry needs to produce around 27 million eggs a day to satisfy demand - it is not difficult to see why caged systems are generally preferred, given the sheer economic reality of the extra land, workforce and expertise required to run a well-managed free range system. " Well, Eva's bottom is looking a lot better and, for about three or four days now, she has been growing about ten new feathers, although there could even be more that i didn't manage to count! The longest is about one and a half cm long, and still at the pointy spine stage, but i really hope these feathers last without getting pecked out! But yeah, so far they have lasted somewhere around four days, and they have never lasted that long before, so cross your fingers. Tilly is covered in blue (!) spines that are about two centimetres long, so she is successfully growing her new feathers for the winter. Nobody else has started moulting yet, although Eva is trying to grow feathers on her bottom again. Also, i get to leave school at one o clock once every week, and as soon as my lesson has finished i am rushing up to the chicken factory to try and get a photo of the hens, but i haven't managed to yet--will keep trying! That's all for now, i'll talk to you later (TTYL!) Byeee! The good news is that THE CHICKENS HAVE A LEAD!!!!!!! As you can see i am very excited about that, although i think it will only be Milly who goes 'walkies,' or at least until Eva is fully-feathered so the leash doesn't rub on her bald bits! And, on the Eva front, she is once again trying to grow feather's on her bottom. Penny and Tilly (especially Tilly!) are both moulting and growing new feathers, so hopefully they will be too busy watching their own feathers to peck out Eva's! That's all for now, will try and post tomorrow if i have chance. Byeee! The chickens at the factory today were white, which i had never seen before, and this made their bald patches and bloody scabs stand out more. Even through the bright yellow crates i could see that these battery hens were in an even worse condition than Eva--far worse. Some were completely bald, and their skin was a horrible bright red colour. And, all the chickens had the tell-tale floppy comb that nearly all battery hens have. Has anyone heard the story about Bernard Matthew's Factory where it is reported workers were 'playing baseball' with the turkeys?? This is a quote from a News article: "A spokesman for Bernard Matthews said: 'We welcome the decision of the court today. The welfare of our birds is of paramount importance to us.'" Okay, so maybe we haven't got round to putting the pictures on or whatever tonight BUT...the font has changed (and looks much better!) and the Chicken Factory page has been updated, and actually has some information on it now--even if it has just been moved from another page!! Also, i am trying to teach Eva to 'jump' on command, even when i don't have food...all the chickens will jump for food (obviously, who wouldn't?!) but i want to see if i can train Eva to do it without food--she'd get a treat afterwards, but she wouldn't be jumping because she could see the food in my hand. I want to see if Eva is able to associate the word 'jump' with jumping...and then associate jumping with a reward! Hope that makes sense--i just want to see if she can learn something new, really. Okay, so tonight is apparently the night when my dad is going to show me how to update the site and change everything. Hopefully, everything will be improved. I'm also thinking of changing the font, because it's a bit 'heavy' and difficult to read--and i want to make the pages wider as well so that it's not quite so...thin?? *The Chicken Factory page will be changed, and some info will be added. That's all for now, speak to you later. Nothing exciting, really...just to say that tomorrow i shall be at the chicken factory...my friend has agreed to come factory-spotting with me, so i may finally get some decent footage. Anybody who has been waiting for this eargerly...it's coming! Cross your fingers, okay?? Eva's doing fine as well, nothing new to say about her really...i have some video footage that i want to try and upload onto the site, but i'm not sure if it will work. It's just a few clips of Eva coming when i call her name, just to show chickens aren't stupid, and prove that Eva is intelligent...she has learnt her new name and responds to it, even if i have no food--i'd say that's pretty damn smart and cute!! Okay, so we have good news and bad news regarding Eva's new feathers. Firstly, Eva *is* growing feathers on her belly and her bottom, which is good. She should be nice and furry in time for the winter, and she will look less...ugly. I know she's beautiful, but her baldness (!) seems to put some people off. More good news: the feathers on Eva's belly are now round and about a centimetre long, and the ends are starting to turn brown and fluffy. She has around ten growing on her belly; the longest is almost finished, and the shortest is just a small spine. However, to end on a happy note, she ahs been acting a lot chirpier and friendlier recently, which is a good sign, and she has finally been accepted as 'one of the flock.' It's so lovely to look out the window, or look on hencam, and see them all snuggled down together :) And, in case you haven't noticed, her comb (the red bit on top of her head!) is no longer floppy, and is finally strong enough to stand up straight!! If anyone likes to check out hencam.co.uk , you will know that Tilly has gone broody...well, seeing as i am off school, it is my job to run outside and rescue the eggs whenever she isn't sitting on them. I saw her down in the coop the other day, so i went to get the eggs and...Milly was up there, laying, and she was sitting on them all!! I knew i had to get the eggs, because there were so many i could even see them with fat old Milly sat on them. I lifted Milly up so she was hovering above all the eggs and, with my free hand, i took out all the eggs from underneath her. She didn't seem to mind too much, just clucked a bit and watched what i was doing :P Bless her, bet she appreciated it afterwards...she had been sitting on ten eggs!! I got some photos of the chicken factory...but it is off the actual building, so i don't know if i'm going to post them or not. I will keep popping over to the factory though, to try and get some photos of the chickens...or video footage, that would be rather cool! Eva is doing well, as are the other chickens. I'm not sure--so don't get excited--but i *think* she has some feathers growing on her belly. I was carrying her today, and i felt something prickly, but i couldn't hold her good enough to have a look...although her bottom is still bald! Anyway, will keep you posted if there's any updates! Okay, to start us off i'll tell you a short story about Eva, which i thought was quite amuzing. I let her out of the coop today, which i always do, and she started to follow me up to the kitchen, where i'll give her some food and a drink. Today, however, because it was so windy, when she tried to follow me she was getting blasted sideways by the wind!!! It was so funny, and in the end i had to go pick her up and carry her inside!! Bless her, she is so small and weedy...although my mum thinks she's put on weight, which is good. I have been going to the chicken factory almost every day and sitting there for around two hours...and so far, i have managed to get NO FOOTAGE!! Almost everytime i've been there has been an empty lorry driving away, so i've *just* missed the unloading process! I stay on public land so i can't get prosecuted for trespassing, and i'm basically trying to get some footage of the chickens when they are in the trucks, because it's a horrible sight and the conditions of the birds is appalling. This is the first post! Yay!